Music of the Spirit & Music As Our Weapon! 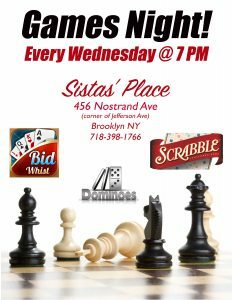 Join us every Wednesday night at 7 pm at Sistas’ Place for an evening of games: Bid whist, Scrabble, Chess, Dominos and more! Take A/C to Nostrand Ave. stop. Get directions.